The Alteo plant, which has long polluted the Mediterranean, is now trying to get rid of 350,000 tons of dry residues of ore each year. Without success so far. "Neither at sea nor on land" : the banner is planted in a large pile of red mud, gathered in front of the Ministry of ecological and solidarity transition, in Paris, on the sidewalk of the boulevard Saint-Germain. Ten tons of bauxite residues were deposited in the blink of an eye, shortly before 9 am, Tuesday, February 12, after having crossed France by truck. Another landed on a street in the 8th arrondissement, in front of the headquarters of the US investment fund HIG, the last owner of the factory Alteo Gardanne (Bouches-du-Rhone). Pechiney has been manufacturing aluminum for more than a century before it became the world's largest producer of specialty aluminas. These materials come in the composition of ceramics, tiles, fireproofing materials, LCD screens, refractory bricks, abrasives ... For the association of defense of the ocean Zea, which claims the action, this deposit is a kind of return to the sender. "We will regularly organize deliveries of red mud to those responsible for these pollution until they stop," warn activists. The solid portion of the red sludge, once dewatered by three filter presses, is now stored in the open in Bouc-Bel-Air. Each year, the industrialist, Alteo Environnement Gardanne is left with 350,000 tons of additional ore waste to manage. Since 2015, he has no longer the right to dispose of his waste in the Mediterranean Cassidaigne, 7 kilometers off Cassis, ie in the heart of the Calanques national park, as he did it from 1966 to 2015. 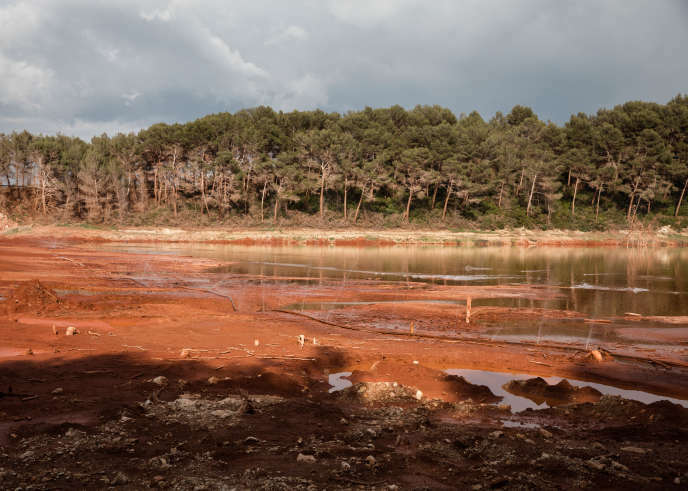 Liquid effluents continue to be sent to the sea via an old pipeline, but the solid portion of the red mud, once dehydrated by three filter presses, is now stored in the open on a Hill surrounded by pines, in Bouc-Bel-Air. The residents of these retention ponds - a crater of Martian look - are on edge: with each big gust of wind, their gardens and their homes are covered with a brown-red hue. Rumors about harmful dust and water pollution are circulating. "In general, residents do not much trust the many expertise performed by third parties, even if they are well-known companies in their field or national public institutions, especially when these expertise are funded by the operator, " writes in his summary the rapporteur of the National Commission of Public Debate, which followed the dossier in 2017-2018.